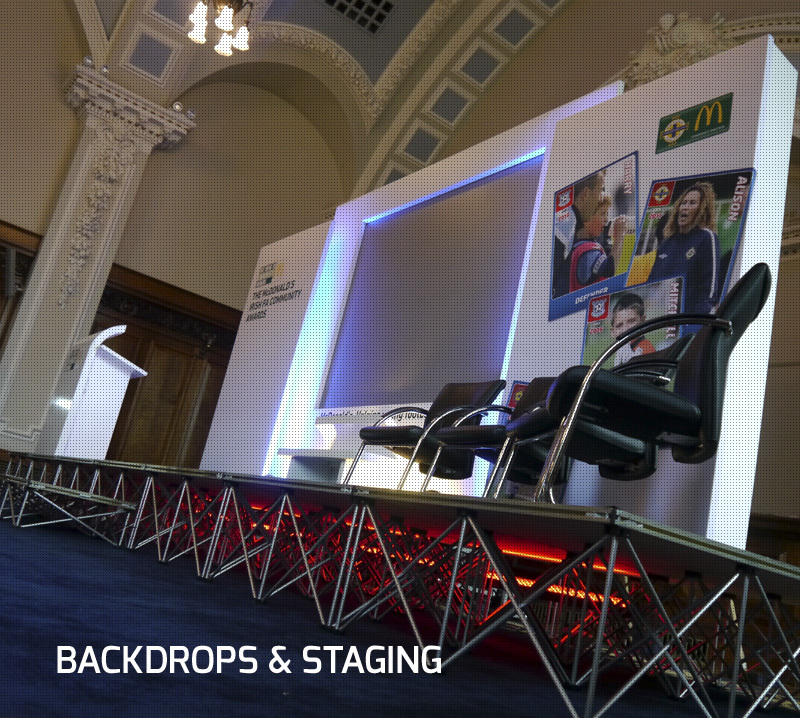 We’ve been creating effective and dynamic sets and staging for the public and private sector in Northern Ireland for over 30 years; ensuring events and presentations are delivered from appropriate and memorable platforms, fully integrating lighting, sound and visual content. Our in-house graphics production capabilities encompass large format printing, print & cut vinyl and computer-cut three dimensional graphics. In addition to a comprehensive hire stock of display equipment, we supply a full range of quality display products from leading suppliers. Large scale conferences, awards ceremonies, official openings, plaque unveilings, media events… UEX have the experience and resources to provide our clients with precisely what they want, with the vision to do things just that little bit differently. Back or front projection sets, custom built or modular, with three-dimensional, inkjet, vinyl or full fabric wrap graphics, product displays, lecterns, staging, lighting, natural planting, directional signage and registration areas, we take a pride in providing the highest quality service with the utmost attention to detail. Needless to say, always on time, every time, and within budget. Our LED UV inkjet printer delivers a unique combination of high quality super wide output for volume production of banners, fabrics, retail, exhibition and window graphics and other similar applications up to 3.2m wide. Our display products are printed using only the most advanced printing machinery, and we regularly invest in new media and materials that provide exceptional results. 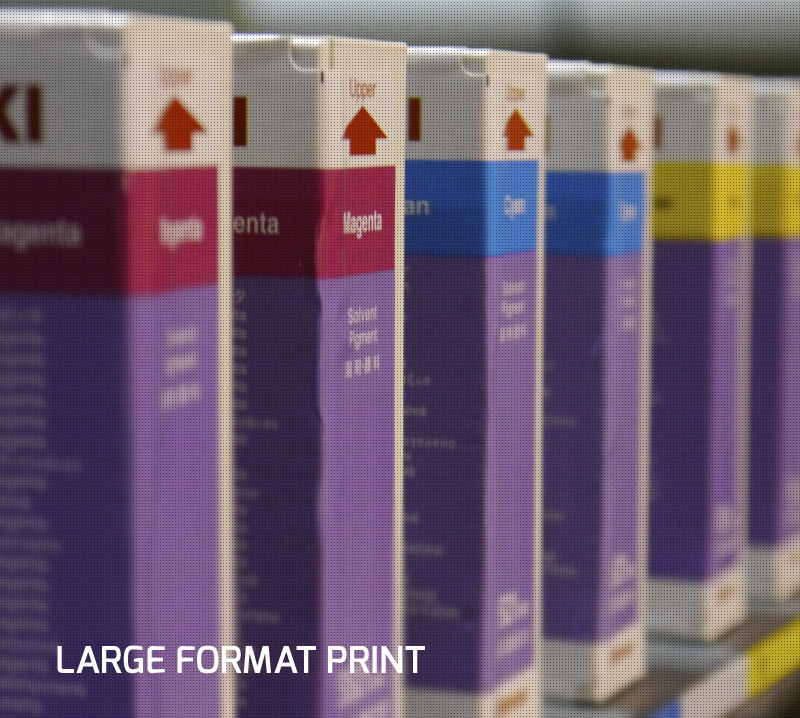 An integral part of our Printing Services is to provide great value for money, where large proportions of our products can be delivered in as little as 48 hours. 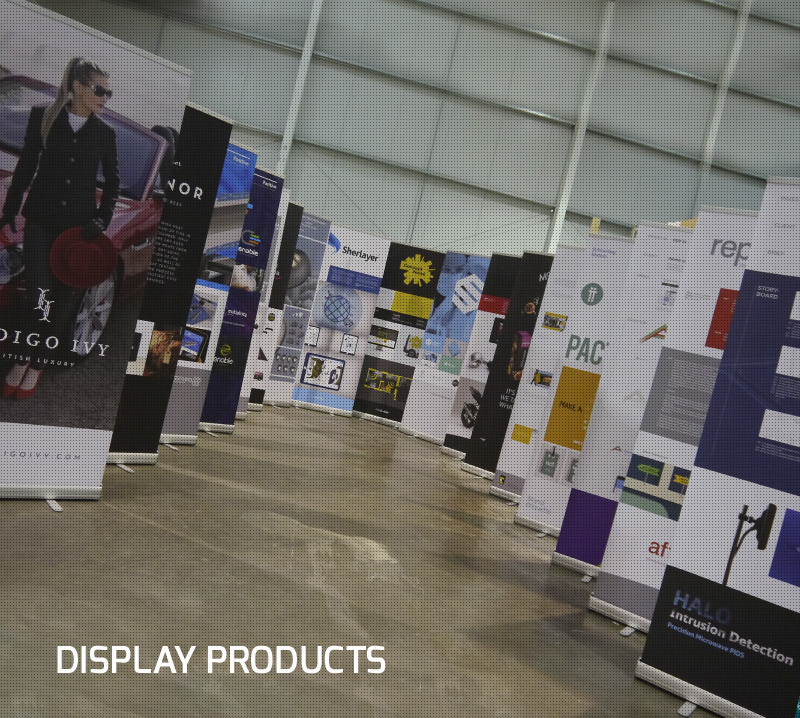 We carry a considerable stock of display panels in our hire stock, available in a range of popular corporate colours. Our system is the best in the market and we maintain it fastiduously to keep it in pristine condition. 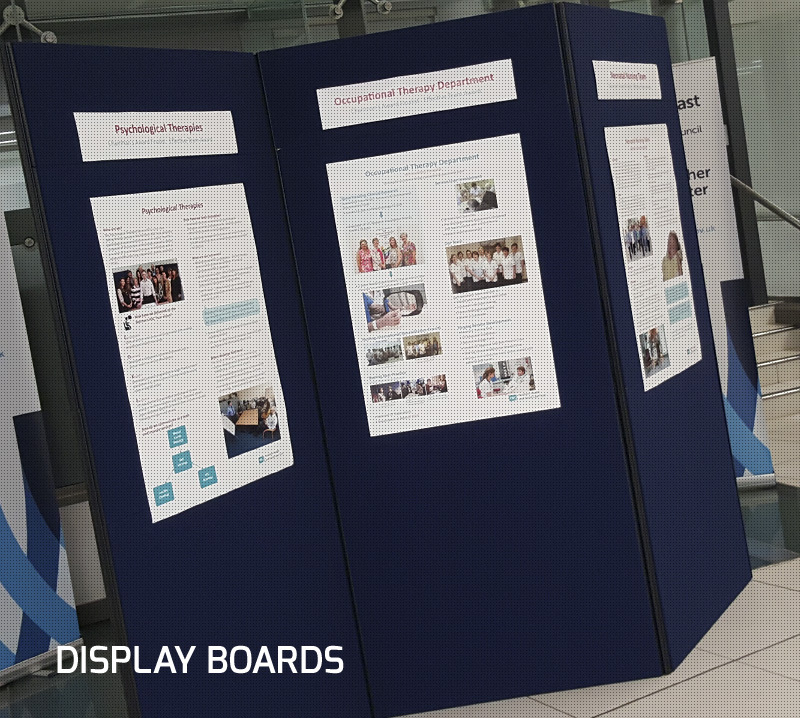 Our display panels are heavy duty, much heavier than standard 'hire' panels, and are linked together by means of a flexible 4-way connecting pole, providing a mechanical join the full height of the panels. When built, this makes the system much more sturdy and secure than standard panels with simple 'clip' connections to a central pole. An added benefit is that this also means our system lacks the gaps inherent in others, creating a solid wall. We offer considerable added value in terms of product quality, however this is complemented by a well practised, rapid installation/removal service and very competitive pricing. We work with all sorts of people from all types of business. Our client base is varied and includes public bodies and departments, private sector businesses ranging from multi-nationals to sole traders. Whether you are attending a global expo or a local trade fair we have the experience and expertise to provide the perfect display solution. If you have booked a space only stand or ordered a shell scheme booth our in-house team will create a cost effective design to promote your brand, business and products. And we can travel . . . we have extensive experience working throughout the UK and Ireland, having also worked across Europe and as far afield as Japan. UEX provide a comprehensive sales service and can supply a huge range of display equipment to our customers. In addition to a wide range of pop-up displays and banner stands, we also supply collapsible lecterns, showcases and counters, wall mounted and freestanding signage systems, together with the range of signage and banners produced within our own graphics facility. UEX are also the Irish distributors for Panelflex, a heavy duty panel and pole system, available in a range of colours – a system unique in that it lacks the ’gaps’ between panels inherent in other systems. UEX have a considerable stock of display and exhibition equipment available for hire at extremely competitive rates. Available equipment includes modular panelling in a range of colours, staging, lecterns, lighting, directional signage, registration counters, plaque unveils, tables and chairs. Our hire service includes delivery, set-up and removal following the event – with the guarantee that your needs will be met to your schedule, to your absolute satisfaction, and to your budget. 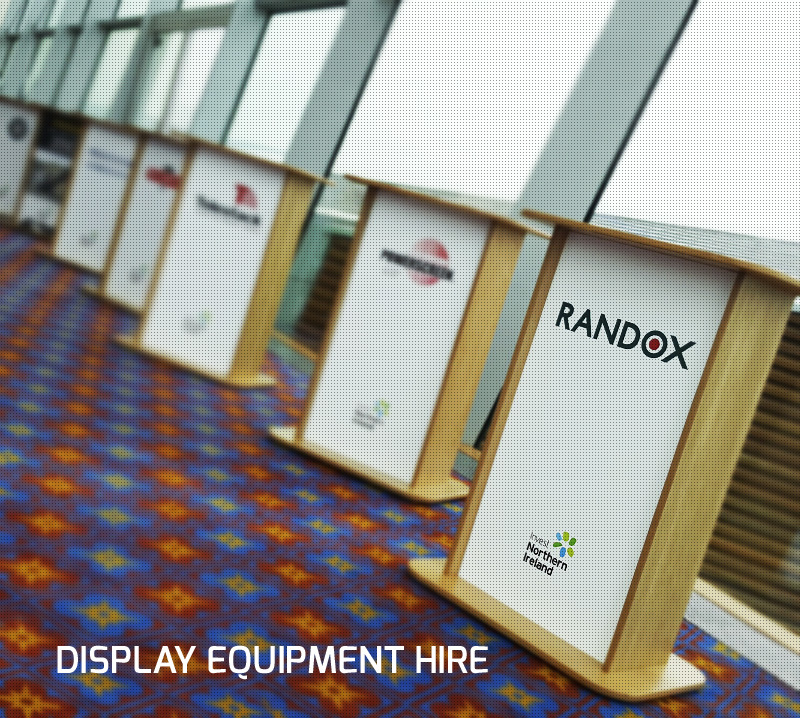 We have a myriad of temporary signage and display equipment to cater for your needs for your event. The items displayed are all in our hire stock in considerable quantities - if you don't see what you're looking for just give us a call. 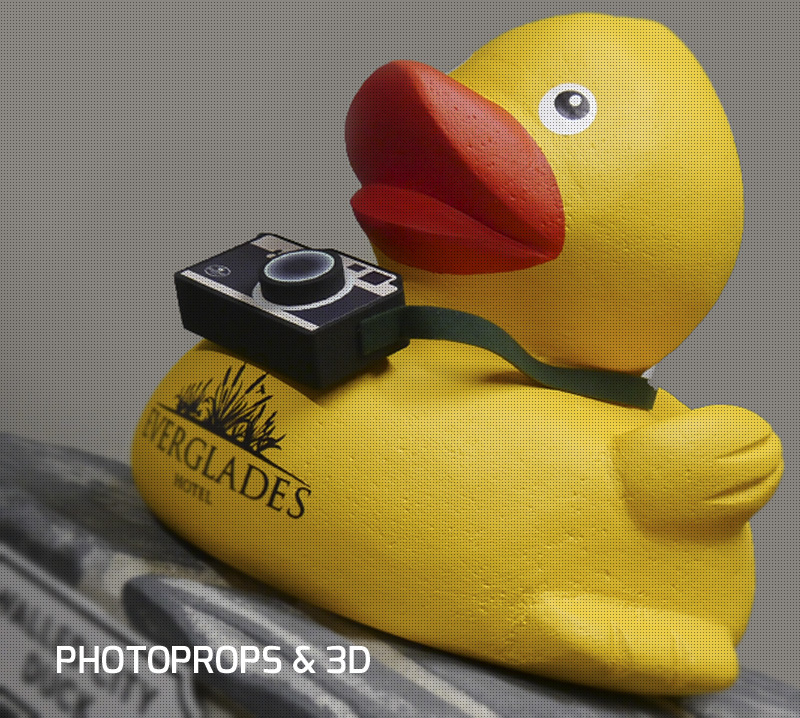 Something of a speciality, UEX has become well known for their ability to design and produce large scale photographic props for PR and promotional work. These are primarily produced from polystyrene (hand sculpted & computer cut), and fully textured & rendered dependent on brief given. Our experience in this nature of work gives us understanding of the objectives to be achieved, and we are always available to give suggestions and recommendations to make your prop most effective, and can provide colour visuals for approval. A core part of our business, UEX operate a 3d graphics workshop in-house. Capable of cutting all types of expanded and extruded foam, the product of our graphics facility has been seen in office receptions, on showroom walls, and in shops throughout the UK and Ireland. 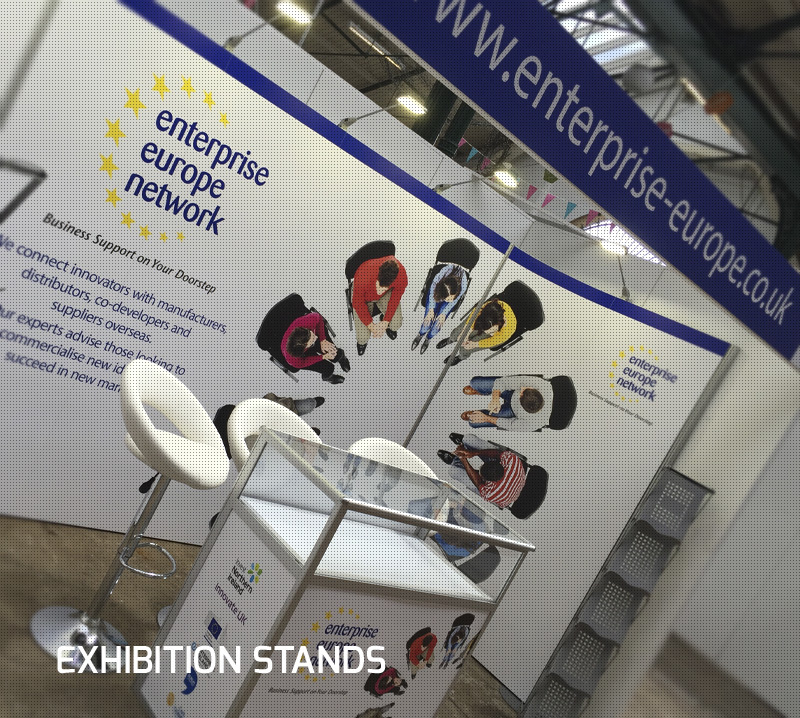 We have also provided graphics for exhibition stands and conference sets across Europe. Much more than straight-forward lettering, intricate detail, shapes and profiles are all achievable – a huge range of finishes can be provided, from metallic, glittered and stone through to corporate Pantone or RAL colour specifications. UEX are proud to represent Panel Systems of Sheffield as Revostage distributors for Ireland - the ultimate portable staging solution for choirs, churches, schools, corporate events and hire companies. 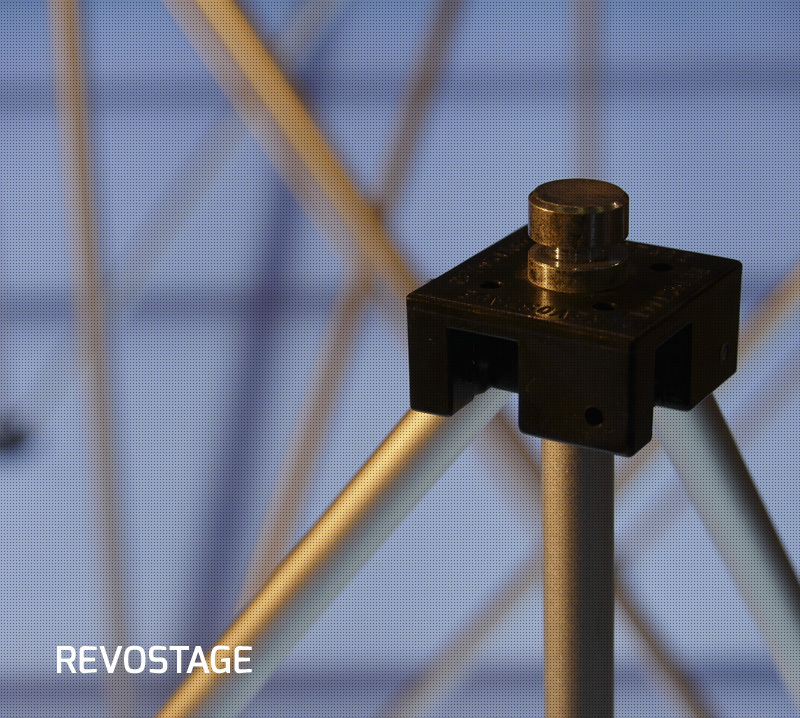 Revostage offers a perfect blend of flexibility, portability, strength, simplicity of use, and ease of storage. All at an affordable price. Your entire stage is lightweight yet is independently weight tested to carry 2000kg per square metre UDL. A single 5mm allen key is the only tool required.